A newfound interest in knife-making has more or less saturated my weekends for the past few months, but I’ve been eyeing this recipe from elBulli’s 2005 Catalog for a while now, based solely on how pretty I think it looks. In between working on a few knife projects this past weekend, I squeezed in a bit of time to play around with this one. 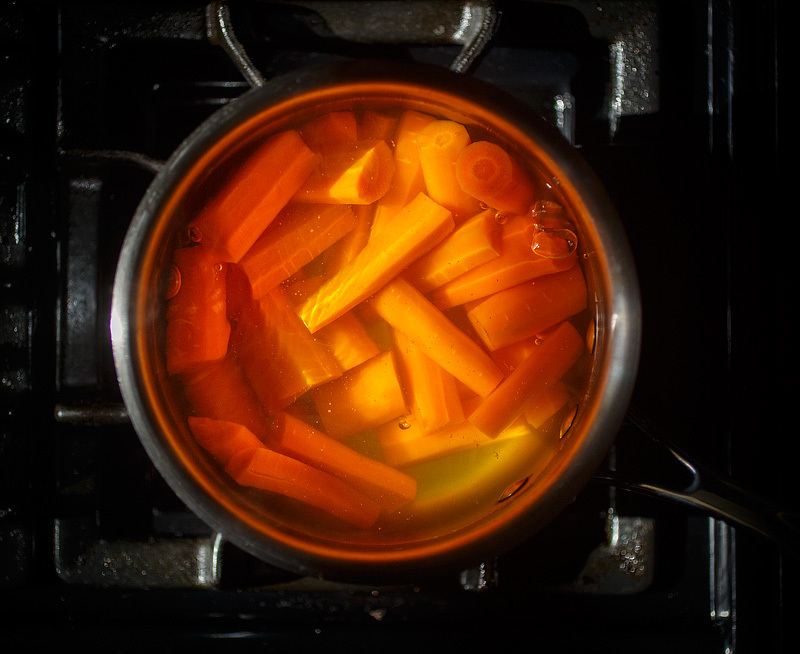 The dish starts easily enough: some carrots are cooked until soft, then pureed in a blender until smooth. This puree is strained through a chinois, then mixed with glucose, isomalt and icing sugar. The reason for these sugars becomes a little clearer in a bit. 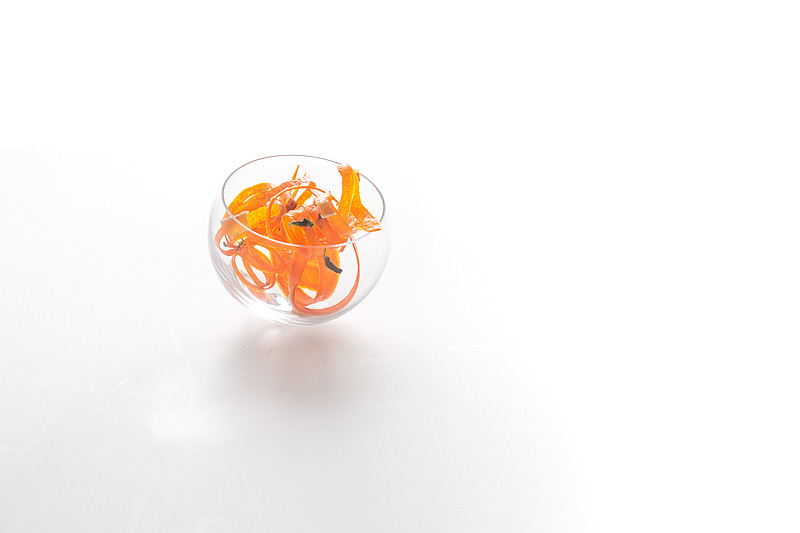 If the Alinea cookbook was frustratingly-sparse in its descriptions, elBulli can be outright absurd. The recipe tells me to smooth the puree “in the size of a PVC mould” onto a silpat, but offers no images or descriptors about how this is meant to work. The puree is then meant to be baked lightly for a few minutes to dry it out. I first used a piping bag to try to pipe (super-crappy, irregular) lines onto a silpat, then smoothing the lines with an offset spatula. The irregularities here led to irregular drying in the oven, which more or less ended in failure. 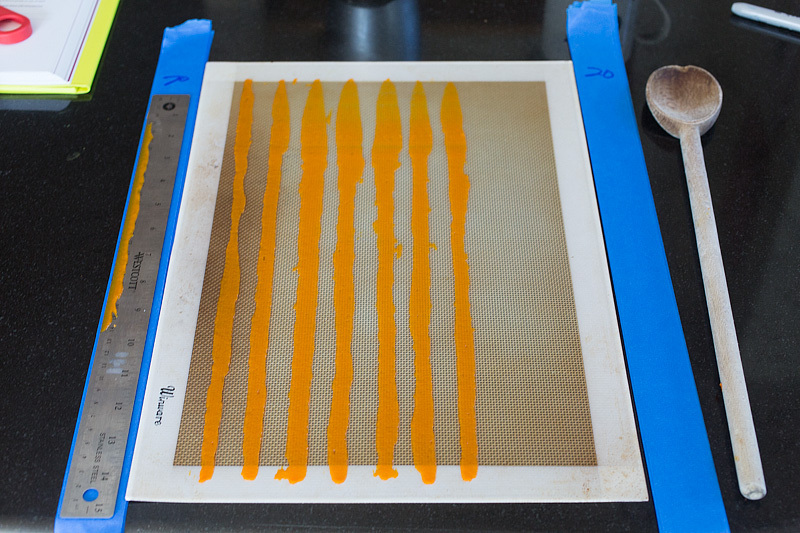 Figuring that I needed to get a consistent thickness to the beads of puree, I next tried laying down two rows of masking tape onto my countertop, then dragging a ruler across the beads to smooth them to a common thickness. This is a trick I hijacked from the Alinea book, except Alinea itself uses ticket rails to do this. 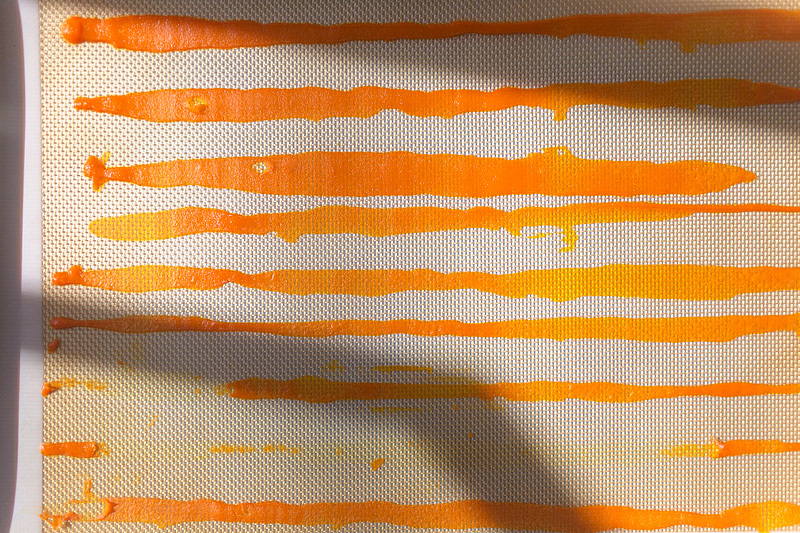 I also played around with the number of layers of tape I used (indirectly varying the thickness of the beads). 20-25 layers seems to get me into a good ballpark. This worked great. 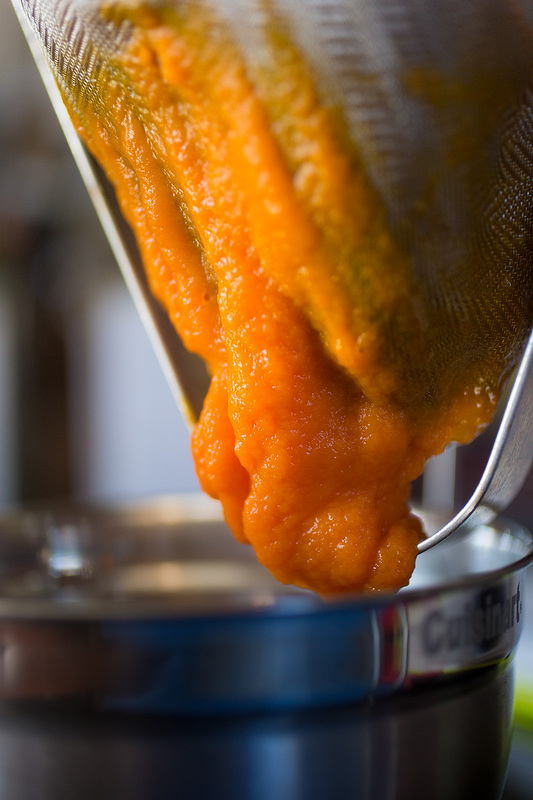 As the carrot puree dried, the cornstarch in the icing sugar helped keep the puree from ‘weeping’ water, while the glucose gave structure and the isomalt helped prevent the puree from darkening (caramelizing) with heat. 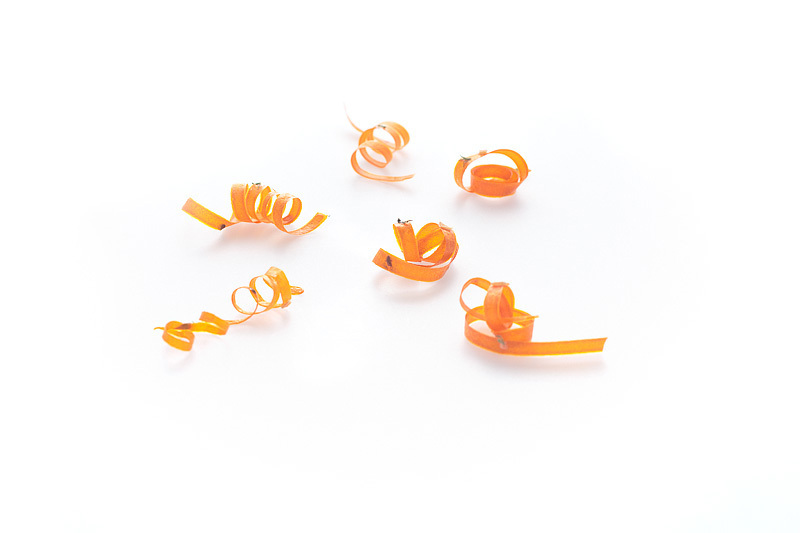 The structure from the glucose was important once the ribbons were removed from the oven: I used the handle of a wooden spoon to curl them into ribbon-like curls, then let them cool until they could hold their shape. 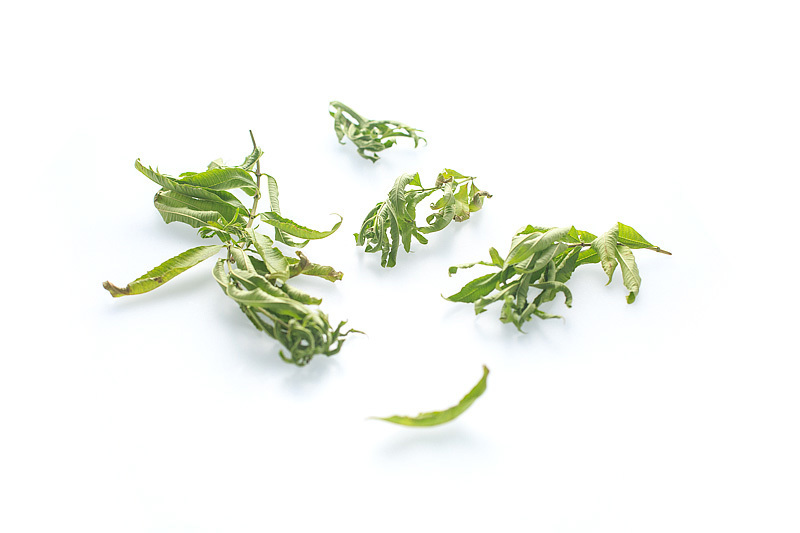 The ribbons, once dry and crisp, were topped with small leaves of lemon verbena, a dab of black licorice powder, and a small square of crystallized ginger. The recipe provides no instructions for any of these (though the former two were fairly straightforward, relatively-speaking). 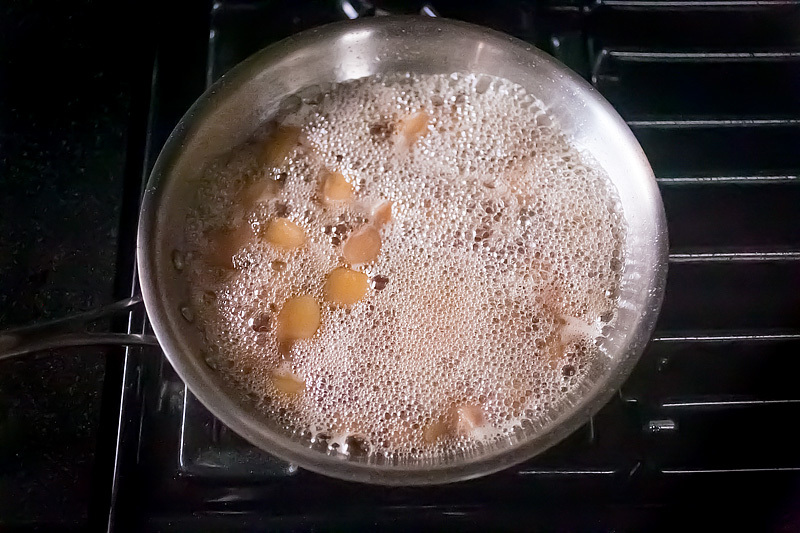 To crystallize ginger, I cut a thumb of fresh ginger root into small chunks, then cooked these slowly in a mixture of water, brown sugar and honey until a thick glaze formed. 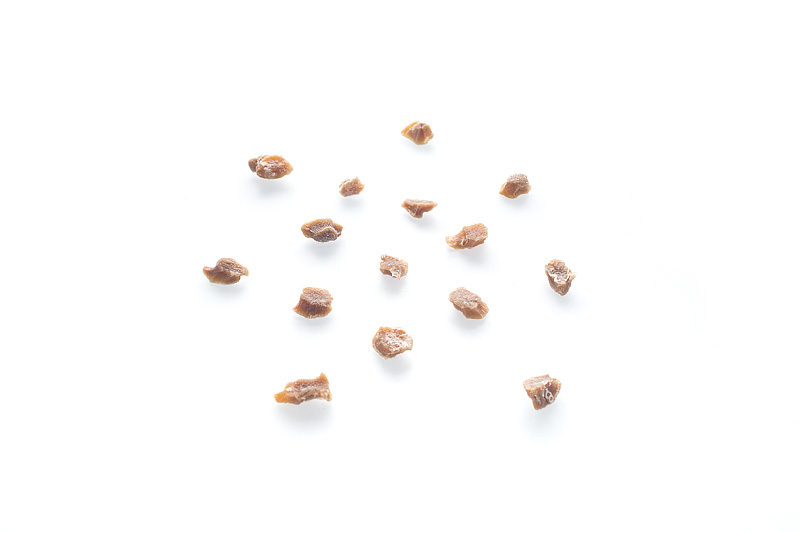 On letting these chunks cool, a thin layer of caramelized sugar forms around the chunks. 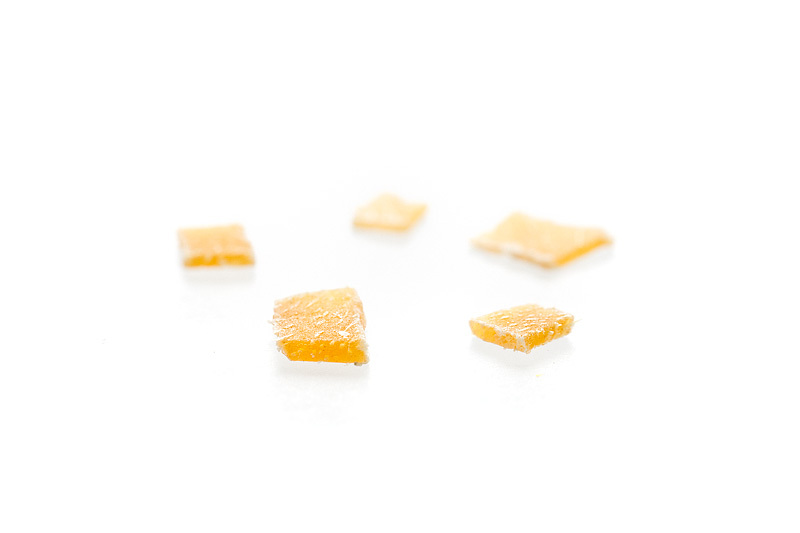 These were cut into tiny, thin squares. 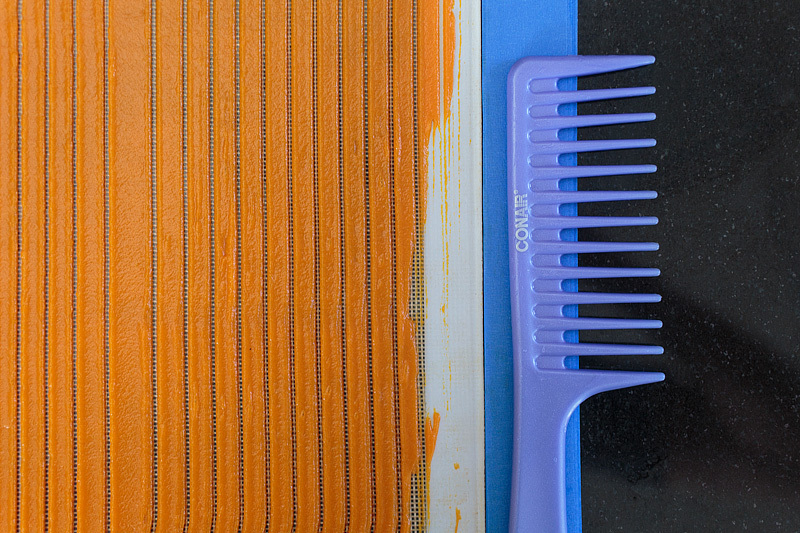 The ginger squares, verbena, and licorice powder were all held in place on the carrot spirals with small dabs of egg white, then the whole assembly was put in a dehydrator for several hours to maximize crispness. 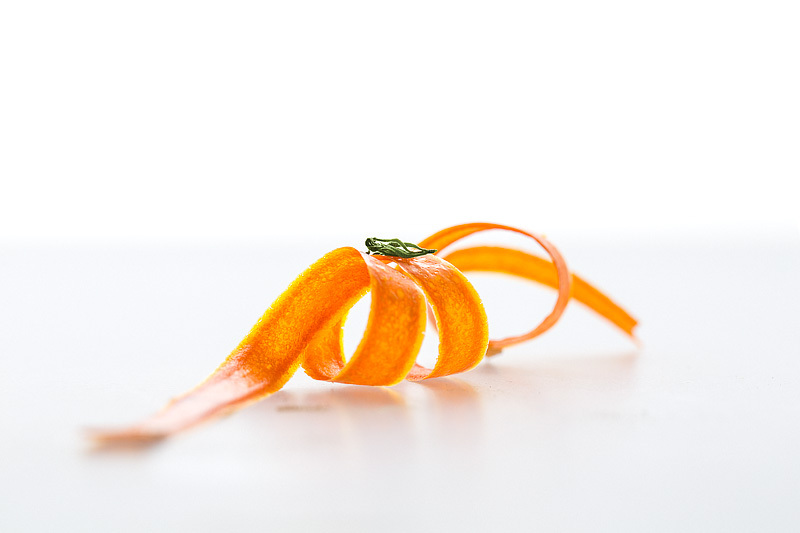 The final bite, once out of the dehydrator, was delicious; the carrot ends up playing sort of a background, supporting role to the accents of lemon verbena, licorice, and ginger. 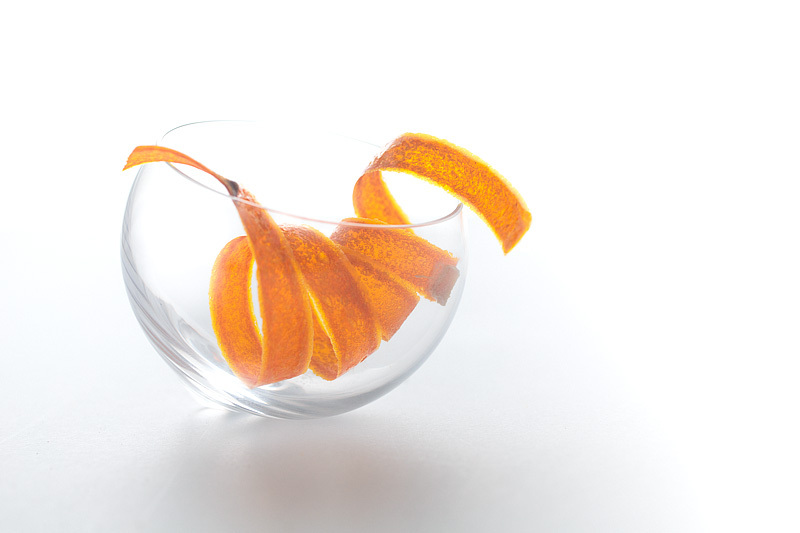 The three accents unfold one after another; there’s first the floral vibrance of the verbena, then the spicy sweetness of the ginger, and finally the bitterness of the licorice at the end, but there’s plenty of overlap between the accents to keep the bite feeling whole. In the end, totally awesome and tasty.